My chair and it’s comfy pads along with a pile of books and my notebook. Remember on the old Frazier show, how it would always end with “Frazier has left the building“, a riff of course on the phrase, “Elvis has left the building“. Well, in response to weekly photo challenge for this week on muse, I find it hard to show what’s calling to me because nothing is. The muse has left the building. I’m spending my mornings hanging out on the deck with the boys, enjoying the cool start to the day. I’m listening to the birds sing, the insects chirp (they were very loud this morning), and just enjoying summer. When I worked, I always resented having to go in on days like this and not being able to enjoy the beauty of a nice day. So instead of writing, instead of taking pictures, instead of getting much done, I’m hanging out on the deck. I have my iced tea and camera. I need my tea and the camera too. I have a dog that I can lean over to pet anytime I feel like it, although he’d rather be inside with the air conditioning. Too bad. They’re all sleeping better for spending time outside in the morning. 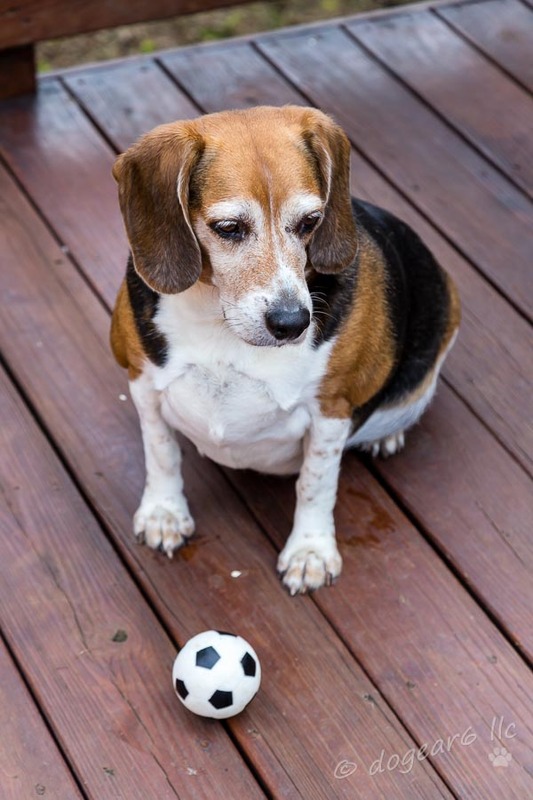 Sometimes I even throw the ball for the beagle, although not for very long. He can’t chase it like he used to; after a few times up and down the steps, he’s worn out. The beagle hopes to get the ball thrown! The trumpet vine is starting to flower. I haven’t seen the hummingbirds yet, but each fall we find one or more tiny nests inside the trumpet vine. They usually announce their presence by buzzing us on the deck. 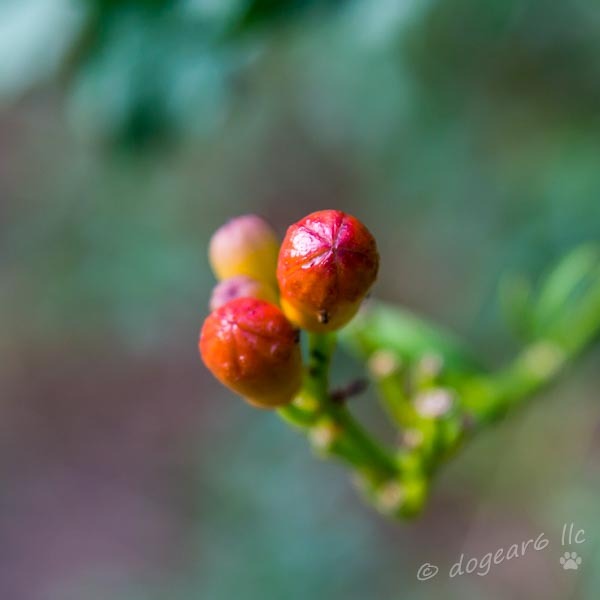 The trumpet vine is just getting ready to bloom. The deck’s actually not all that big, but I enjoy it and I enjoy our backyard. View of the entire deck thanks to my fish eye wide angle lens. The muse will return at some point. In the meantime, I’m re-reading my J.D. Robb books, lap swimming in the afternoons after it’s gotten too hot out, and listening to videos / webinars as I move forward with my plans for a new life not in taxes. Of course, having said that, I start a contract position next week that will last several months. It was due to the network that I got this opportunity – this VP knows my former VP and recognized my name as a result. It also helped that the position is in my niche speciality – corporate state income taxes – and uses the same software I’ve used for my entire career. So the muse might take a longer vacation than planned. Oops! I like your artistic touch to your chair photo. Very cool. You have a nice size deck. Employment for several months–not bad. :) I’m glad you’re having time to enjoy some nice mornings on the deck. Thanks for the note and encouragement. 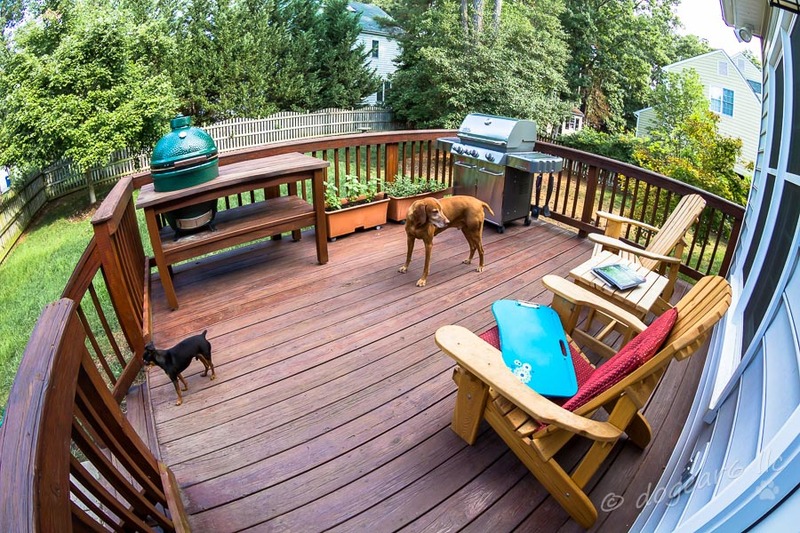 The deck isn’t a bad size, but with two grills it’s gotten a bit cramped. I do miss mornings on the deck now that I’m working, but the job is going well and I’m glad they offered it to me. Thanks for the note! I’m glad you liked the photos and the painting. The beagle and min pin both love to bake outside and will stay out a long time if we don’t make them come in. I don’t think I could survive summers here without AC, but I do miss the fresh air when it’s so hot and humid out. Molly wins – the beagle only finds rabbit poo to roll in. Still stinks him up though. It’s even worse when they take turns rolling in it and all three stink at once. Thanks Darlene! I looked pretty diligently for a job for quite a while before I decided to retire. I still hadn’t gotten my routine squared away when I got this contract opportunity. It’s going well and I’m enjoying the work, but everything has slowed down now with my time being limited again. Thanks Dennis! I’m glad you enjoyed the video. Thanks for bringing us along on your moments of relaxation Nancy. 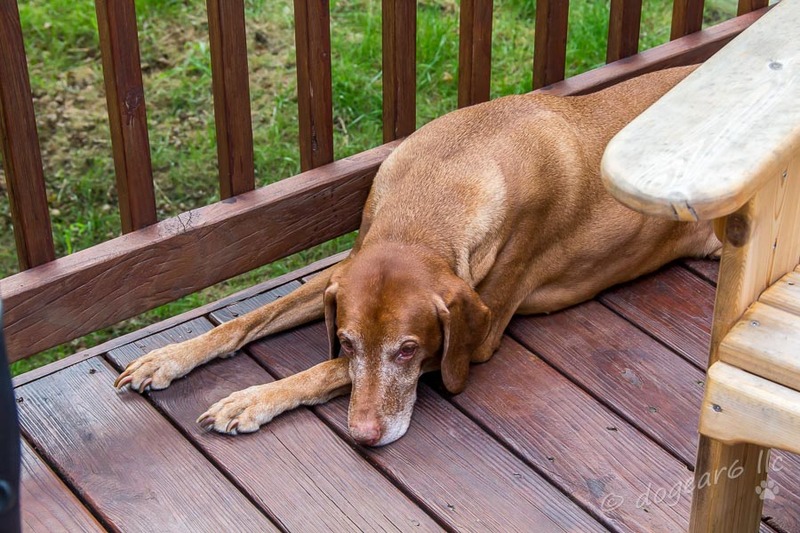 I love your old pup waiting for a toss of the ball, and the Viszla (isn’t that a Hungarian dog? My Dad was Hungarian). 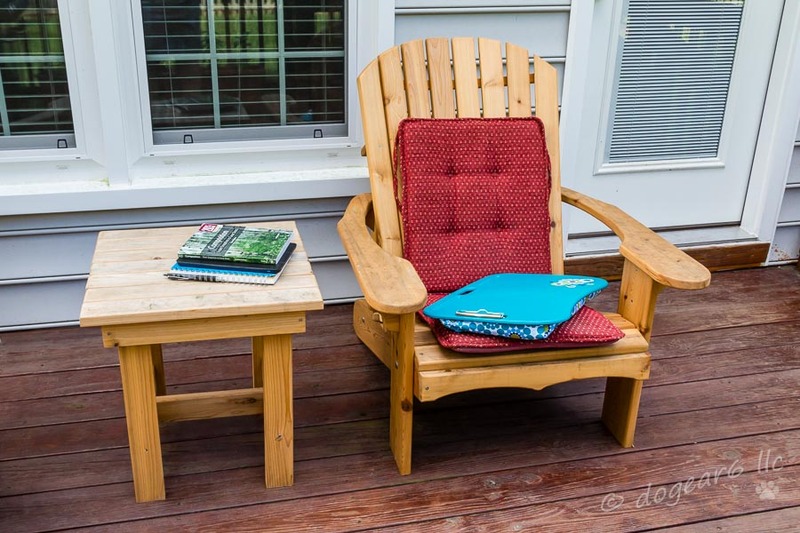 Lovely photos and that deck is so inviting, no wonder you like your mornings there. I’m glad you enjoyed. The beagle is really getting up there in age. I think last week was the last time he will go upstairs. He just can’t make that long flight up anymore. He can still do the short deck stairs, but I don’t know what we’ll do when he can’t make those anymore either. Yes, the Vizsla is Hungarian. They nearly died out after Archduke Ferdinand was assassinated as they were a sign of wealth and royalty, who killed them in droves to prevent discovery. They’re supposed to be hunting dogs, but mine is a total princess. I don’t see how anyone could hunt with him. And yeah, that deck sure is special. I hated it when we moved to Richmond so badly that we decided to make the backyard a nice little place to relax and it did help until I got more acclimated to living here. What a great start to the morning. I am sitting here in Wyoming now, a dog on each side of me. Listening to the birds, and the nearby river. Your deck is a lovely respite, I can see why you like it. Thanks Mary! Your morning sounds pretty good also. I think you’re right! I hadn’t thought of it that way, but yeah! Who needs the muse with a morning like that! 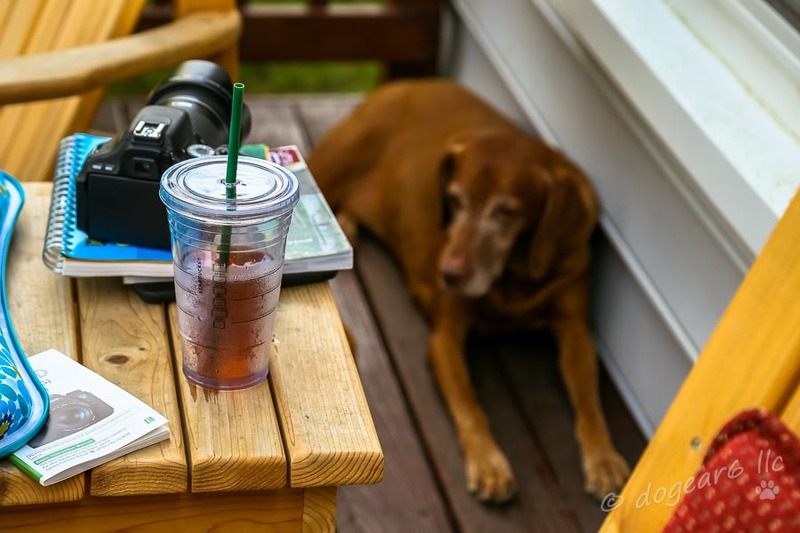 We love spending mornings on our deck, but sadly only have the weekends to do it. The weather has not cooperated with us very much lately, with all the rains we’ve been getting. I miss deck time! I can sympathize with wanting to spend time on your deck and yours has a fantastic view too! Not being able to spend my morning outside has been a gripe of mine for years, so I want to get in all the time I can. Tomorrow though I start a contract job, so I’m back to weekends only for the next two months. Good luck with the new job! I hope your weekend weather is more cooperative than mine has been…. Thanks Debbie! Nah, the weather’s been as bad here. I see you post the thunderstorms over the edge of your deck and they roll in here a little while later. That’s why we went to Williamsburg today – cooler temps, low humidity, pretty sky – such a nice treat! Thank you! I’m glad you liked how the fish eye showed it and for the well wishes in enjoying my summer. Nancy, THIS is the kind of morning I would enjoy. Enjoy the short break you have. Take in a little extra morning freshness for me. I have (quite) a few years, or a lottery to win, before I can have a morning like this!!!! You make it look sooooooo very good! Thanks Colleen! It’s exactly the kind of morning I’ve always envied when I was working and heading out in the morning. It’s nice to have a break and actually enjoy them. Thanks Colleen! I really enjoyed it too – I wouldn’t have taken that contract job except they were so nice to me and made it worth my while (unlike others who barely offered above what the interns were making). So it’s nice to be working for a while, but I do miss my free time. You really hit on something I did for years – I didn’t want to wait to have a life. I might not have enjoyed things as much as I’d liked, but I didn’t wait to do things. I lowered my expectations and managed my time carefully, but I’ve done a lot of what I wanted before now. With going back to work (the contract job is going really well too), my time is more limited again but I’m still doing good with having a life. It’s good to hear the contract work is going well. I remember when my husband started substitute teaching, I was worried he would hate it. He doesn’t at all. To me, that was a relief. I don’t want him to be miserable. I’ve learned I think, from the people I see in my job…. the elderly who can’t or don’t or didn’t do what they wanted. I learned to not wait. I have to say, it was a lesson I needed.